On a hot summer day this lemony scent is a breeze of freshness. It brightens up my mood as the zesty, sparkling scent slowly settles into a sophisticated floral base note. Verbana by L'Occitane is a very unique citrusy fragrance enriched with organic verbena extract from Provence. It draws inspiration from freshly harvested green verbena leaves that fills the air around the markets of Provence. Verbana by L'occitane is an herbal scent crafted with the best ingredients and it smells amazing. I love it when I am out on the patio enjoying the summer sun, while my husband prepares the BBQ and a little spritz of Verbana all over my clothing just adds to the ambience. This clean scent is a reminder of summer fun and I used it a lot this weekend. I attended Calgary Stampede breakfasts and BBQs and worked in my garden to prepare it for autumn. The fragrance of Verbana energizes to seize the day and do whatever I desire. The scent doesn't last the whole day on me but much longer on my cotton tunics. The fresh burst of citrusy notes at the top captivates the senses before it gradually settles to a floral base note that I think is rose. I am not sure though. Its slightly woody in the middle but not overly masculine or feminine. Its a kind of fragrance anyone can use. 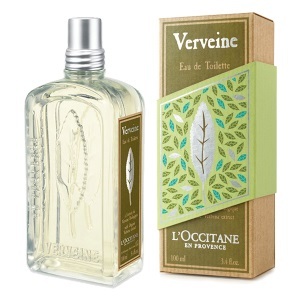 Overall, I feel that L'occitane's Verbana Eau de Toilette is a clean, fresh scent for summer time. It immerses me in the lemony fresh experience that is energizing to the mind and soul yet calming and satisfying. Next time you visit L'occitane's store, spritz a little on your wrist and feel it yourself.